Nagaland is an Indian state situated in the northeastern part of India. The capital of Nagaland is Kohima and the biggest city is Dimapur. Nagaland was formed on 1st December 1963. Agriculture is the important source of economy of Nagaland. Forestry, cottage industries and tourism are gaining momentum recently. In 1816, the area comprising the present Nagaland came under the influence of British and they took it under their control in 1826. 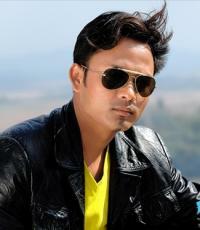 It was at that time a part of Assam. 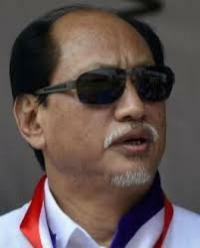 The people of Nagaland are called Nagas. There were political riots in the region in 1955 and Indian Army intervened in the affairs to restore order. But the civil disobedience continued and the discussions between the Prime Minister of India and the leaders of the Naga People Convention went on. According to the agreement, the State of Nagaland Act was passed in the parliament in 1962 and it was given complete statehood on 1st December 1963 with Kohima as its capital. The first legislative assembly was formed on 11th February 1964. 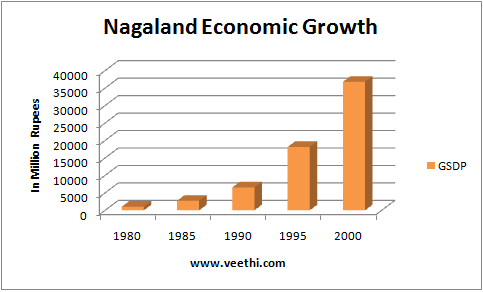 Nagaland spreads over an area of 16,579 square kilometers. It has Assam in the west, Arunachal Pradesh in the north, Burma in the east and Manipur in the south. The state is mostly mountainous. The highest peak in Nagaland is Mount Saramati which is 3840 meters high. The rivers that flow through Nagaland are Doyang, Diphu, Barak River and Chindwin River. The state is full of evergreen tropical and sub tropical forests and they are rich in flora and fauna. The average annual rainfall of Nagaland is between 1800 mm and 2500 mm. In summer the temperature of Nagaland ranges between 21 degree Celsius and 40 degree Celsius and in winter it drops to as low as 4 degree Celsius. The maximum average temperature in winter is 24 degree Celsius. Nagaland is rich in its vegetation and the important species that are found in abundance here are bamboo, palms, mahogany and rattan. Some of the animals and birds found in Nagaland are pangolins, porcupines, elephants, leopards, bears, sambar, buffaloes, Blyth’s Tragopan, Mithun, etc. 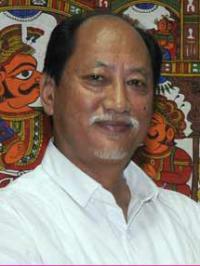 There are 11 districts in Nagaland as of June 2012. 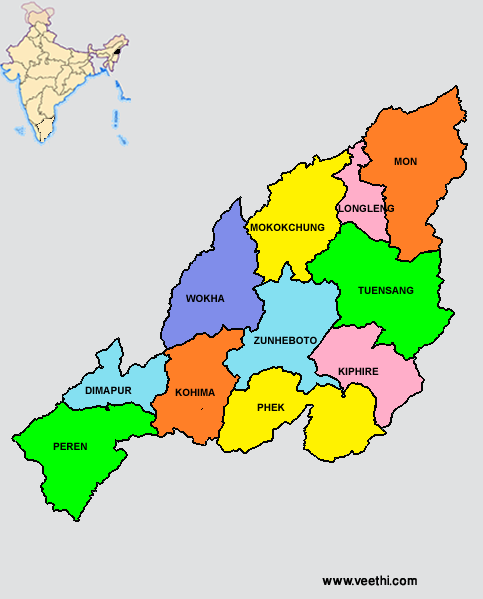 Given below is the Nagaland state map with all 11 districts marked. The total population of Nagaland is 1,980,602 with a density of 119 people per square kilometer as per the census of 2011. 75% of the people live in villages and one third of the rural population and one fifth of the urban population are under the poverty line. There are 60 different dialects spoken among the people of Nagaland and these languages belong to the Sino-Tibetan language family. English was made as the official language of Nagaland in 1967 and serves as the medium of education. Nagamese that has no written form is considered as the linking language that links the tribal groups. Some of the tribes of Nagaland are Ao, Chakesang, Khiamniungan, Konyak, Phom, Rengma, Sumi, Kuki, Zeliang, Angami, Konyaks, Angamis, Sumis and Lothas. Many of them are indulged in handicraft works like making mats, wood carvings and bamboo works. Folk dances and songs have important place in the life of the tribes of Nagaland. Christianity is the main religion of people of Nagaland. 90.02% of them practice Christianity and most of them follow Baptism. Hinduism is practiced by 7.7% of people and Islam by 1.8% of people. Apart from religious festivals, Hornbill Festival is launched by the Government of Nagaland to promote the cultural heritage and tourist activities. This festival is celebrated for a week. Agriculture is the main source of economy of Nagaland and the important crops are rice, corn, tobacco, sugarcane, potatoes and pulses. But the state has to import food grains from other Indian states to tackle the deficit. The terrace cultivation and jhum cultivation is practices. The GSDP of the state was 1027 million rupees in 1980 and it grew to 36790 million rupees in 2000. In 2004, the GSDP was at $1.4 billion. The national highways run to a length of 365 kilometers in the state. NH 61, NH 39, NH 36, NH 150 and NH 155 connects the places namely Kohima, Wokha, Dimapur, Doboka, Imphal, Kiphire, Mokukchung, Naganan, etc. Apart from this, the state highway runs for a length of 1094 kilometers and the railway line runs for a length of 12.8 kilometers. There is one airport at Dimapur which is located at a distance of 43 kilometers from the state capital Aizawl. The Air India and Jet Airways fly regular flights from Kolkata, Dibrugarh, Imphal and Guwahati.